Water-activated powder cleanser with fresh Vitamin C to purify, brighten, retexturize. Ultrafine powder activates with water for an exhilarating cleansing experience that delivers visible benefits. Instantly skin is awakened, purified, with a refined texture and brighter look. Non-drying, non-stripping formula is gentle enough for use each morning, and preps skin for treatment with Clinique Fresh Pressed™ Daily Booster with Pure Vitamin C 10%. Fresh means powerful. Pure Vitamin C naturally degrades when exposed to oxygen, so it's most powerful when fresh. Stay-fresh packaging isolates the pure Vitamin C until activation, maintaining its freshness and full power for maximum results. Quantity 1 month supply (28 packets). Massage over face, avoiding eye area. For best results, leave on 1 minute to retain the full power of fresh vitamin C. Rinse well. For topical use only. Do not ingest. 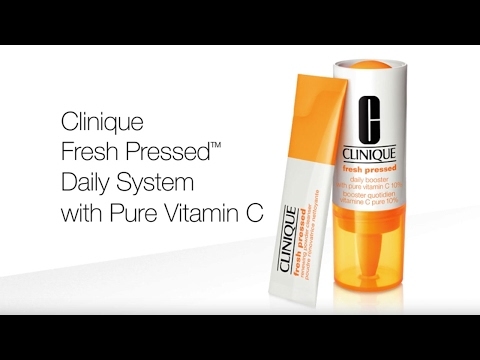 Take the Clinique #FreshPressed 7-Day Challenge and share your results with us.